DESCRIPTION: Beautiful house with large deck looking out towards the ocean. During the season, pool & dock are available. There is also a tennis court and, for an additional fee up to 3 more cabins are available if more room is needed. 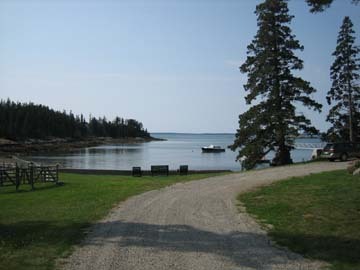 This house is part of a shore front family compound in a quiet area of MDI with beautiful sunsets. A perfect property! LAYOUT: FIRST LEVEL: Great room w/stone fireplace, kitchen/bar, dining area, living room w/sliding doors to the deck, den, full bathroom, bedroom with twin beds, bedroom w/queen size bed. SECOND LEVEL: Small bedroom with a twin bed. 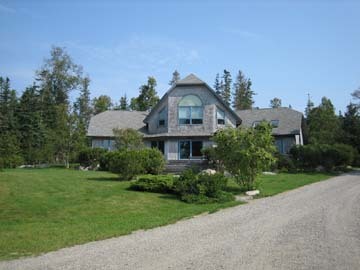 Huge master suite w/king size bed, bathroom w/double sink & double shower overlooking the water. GUEST CABINS AVAILABLE FOR AN ADDITIONAL FEE <SEE BELOW>: Roadside Cabin is located across the driveway has a king bed (2 twins together) and a bath with shower only. Halfway Cabin is closer to the water. It has a double bed and a twin bed as well as a bath with shower only. The guest cabins are rented only in conjunction with the Main House at an additional rate per week, per cabin, with a max occupancy of 12. SPECIAL CONDITIONS: Pool and dock may not available for use after Labor Day.